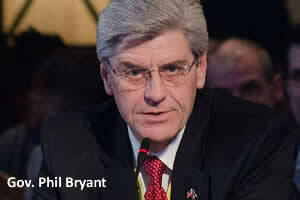 Mississippi Governor Phil Bryant and Attorney General Jim Hood have asked a federal appeals court to stay a federal judge's ruling striking down the state's ban on gay marriage as an appeal is pursued. On Wednesday, U.S. District Judge Carlton Reeves struck down Mississippi's ban, saying that the 2004 amendment to the Mississippi Constitution violates the Fourteenth Amendment of the U.S. Constitution. Without a permanent stay, Reeves' temporary stay is set to expire on December 9. Bryant and Hood asked the Fifth Circuit Court of Appeals in New Orleans to block the ruling no later than December 8. The Fifth Circuit will early next year review similar challenges to marriage bans in Texas and Louisiana. The hearing comes nearly 11 months after a federal judge declared Texas' ban invalid. “[T]his Court should take action to prevent Mississippi from having to endure the same experience,” officials said.